We've put together a list of 10 books you can read to learn about the whole year and the four seasons. Some are favorites, others are new titles for us. 1. When Lucy Goes Out Walking by Ashely Wolff. Lucy is a little puppy who loves to play outside. Over the course of the year she sees all the seasons and grows up too! 2. The Year Comes Round, Haiku Through the Seasons by Sid Farrar. Simple, meaningful Haiku poetry and beautiful illustrations take the reader through the entire year and all four seasons. A recent library find which is a new favorite in our house. 3. The Year At Maple Hill Farm by Alice and Martin Provensen. Each month means something different for the farm animals at Maple Hill Farm. 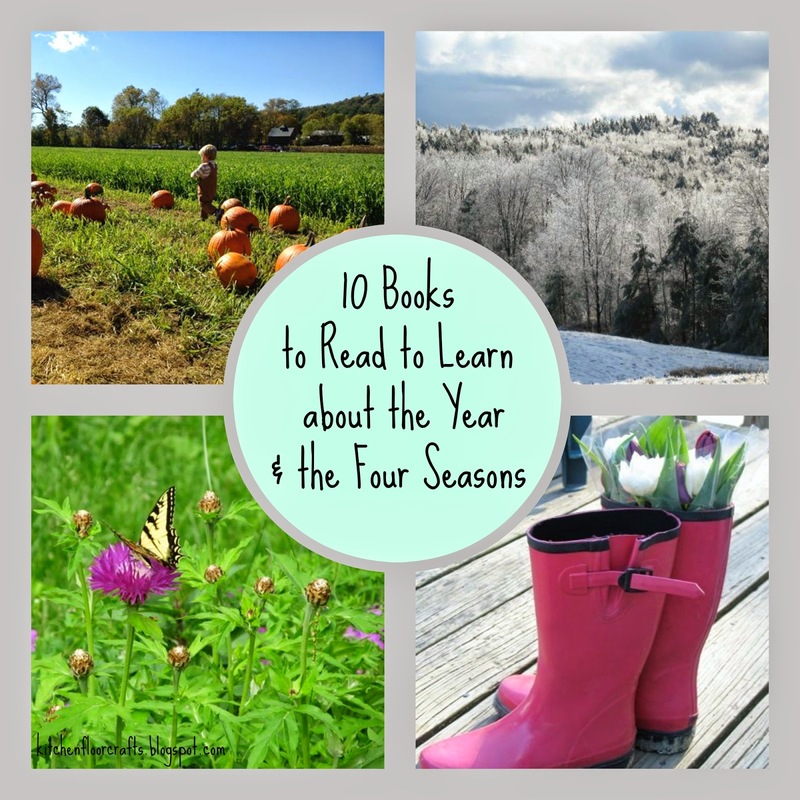 Readers get to see the seasons through the eyes of the farm each month. 4. Frog and Toad All Year Long by Arnold Lobel. These classic tales of good friends Frog and Toad follow them through all four seasons in this short chapter book. Great for beginning readers, but also still fun to hear read aloud. 5. Toot & Puddle by Holly Hobbie. Another tale of two good friends. While Toot is off exploring the world, Puddle stays home to enjoy some great, local, seasonal adventures in Woodcock Pocket. 6. Around the Year by Tasha Tudor. Tasha Tudor's illustrations and words remind us that there is something to enjoy every month of the year. 7. A Child's Calendar by John Updike. Poems for each month of the year which beautifully tell about the celebrations and changes each month brings. Illustrated by Trina Schart Hyman. 8. Tree for All Seasons by Robin Bernard. Photographic picture book designed to help young children learn about the seasons. 9. The Reasons for Seasons by Gail Gibbons. In her understandable style Gail Gibbons explains why we the position of the Earth creates seasons. 10. Watching the Seasons by Edana Eckart. A young reader science series, this one focusing on observing the changing of the seasons. • Take a photo each season of the same spot outside and see how it changes over the year. • Draw a tree four different times during the year, once each season, and see how it changes. • Take a picture of your child each season in the clothes they wear to be outside, make your own season book. • Go for a nature walk each season and as a family write down what observations you have about the weather and nature while on your walk. Reread at the end of the year. • Each month on one chart write down all the events and holidays that happened that month, at the end of the year read them all aloud. Do you have a way you and your family keep track of the year passing? Please share in the comments below.